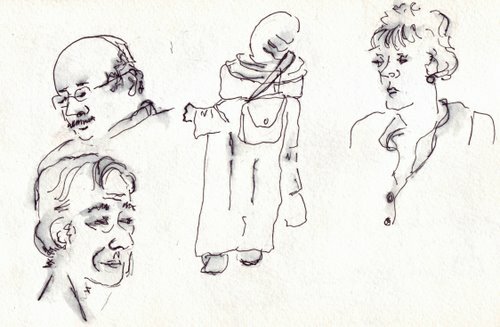 Some sketches done over a period of time, all in moleskine with a pen and water brush. 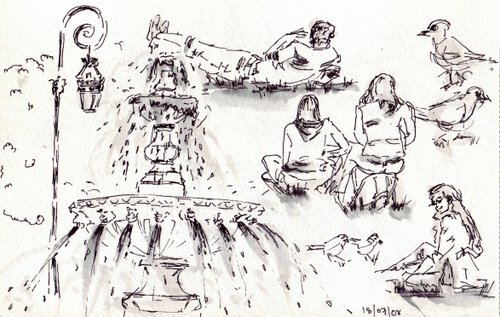 The first two sketches was done in Paris during the summer, while I was nervously waiting for our daughter who had her interview(first job!!) with an architect. 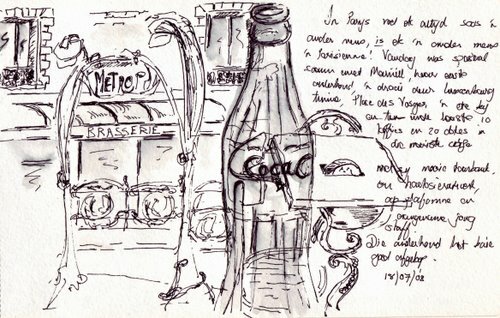 She is now working and living in Paris. 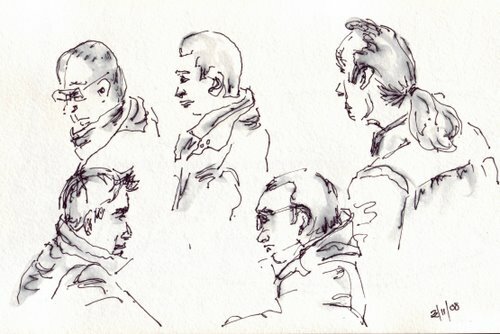 The next three sketches are some faces from all over… some OK, some bad and some really bad. I’m quite content with the guy with the ponytail…it looks exactly like him. 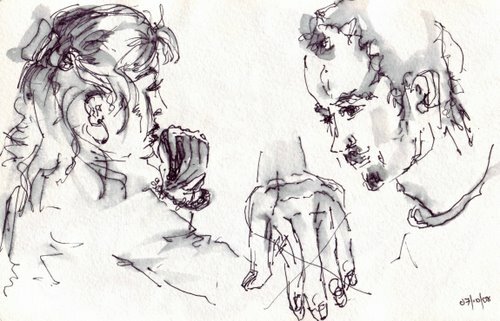 Pen and wash in moleskine. 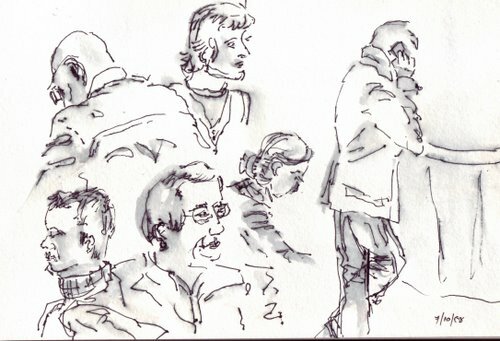 And lastly, some people in motion, pen in moleskine. Here I’m happy about the “artist”; he was extremely busy, bending down, having his cloth fall often, painting wildly and I’m chuffed with capturing his energy. Oh I am so glad to see you posting again1!! I love the looseness of your figures and the FUN aspects they represent!! I”m missing you!! Some great character snaps here, Ronell. I couldn’t spot any ‘bad ones’, they all have life and energy and are full of gestures. Like Lin, I am always happy to see you’ve posted. Glad to see you fun post! Congratulations to your daughter! I agree with the rest, I don’t see any bad ones. More, please… And I am amazed by anyone who can capture people in motion. I am still trying to get them on a video on the PAUSE. There’s such energy and joy in your people drawings! None of them are “bad”, you’re too hard on yourself. I think they are fabulous! Oh, you’re back!! (Me too.) It’s so nice to see you posting again! Your sketches are super, as always! You seem to capture so much movement in each figure. And the poses are all unusual. It’s not just some person sitting down, they are doing something. I love them all! Congratulations to your daughter! Great to get a job, especially these days. These are all great! I didn’t see any “bad” ones. They all look interesting to me. Congratulations to your daughter, too–she takes after her talented mom, evidently. These are so wonderful Ronell!! So vibrant and full of life. And so good to ‘see’ you. Just off the left shoulder of Pony Tail Man is a brilliant Schubert likeness! Not “bad” at all! Clearly, you’re feeling better. 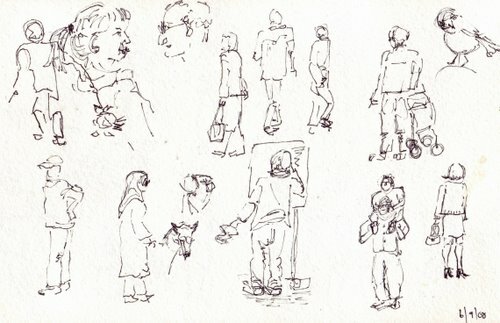 Terrific lively sketches, Ronell – love seeing these glimpses of life through your pen. Living and working in Paris sounds like a dream come true! Great work, Ronnel and, always the sweet touch of the brush! Thank your for all the visits and comments. I appreciate it!